Notes: Made in one of the new distilleries that has recently opened up in Brooklyn Using an organic New York State wheat alcohol, distilled in a 300 liter alembic copper still using a mercury vacuum to reduce the pressure within the still allowing them to distill at lower temperatures.The list of ingredients is impressive, using the best wild-crafted, organic and relatively exotic ingredients, they have created a very impressive gin. The list of ingredients includes:Wildcrafted Italian Juniper, Organic coriander, organic German chamomile, organic Pacific Coast Elderflowers, organic Pacific Coast Elderberries, handzested Floridian Orange and California Lemon peel, organic Ceylon Cinnamon, organic Thai galangal, organic Tuscan Orris root. Appearance: Clear, bright,almost like a bright molten glass puddle.Leaves a clear thin coat on swirling then the edgeline turns to legs and some stray droplets. First Impression: Very subtle but extremely complex and nuanced bouquet, an interesting symphony of herbal earthiness, berries, fruits, and bitter herbs. Taste: Racy, lean, delicious if a touch hot with a lingering finish of galangal,citrus,flowers and the bitter herbs all providing an organic structure of complexity,subtlety, and crispness. You can actually taste all the ingredients both as a group and later as a progression, almost a subtle parade review of each ingredient in turn. Drinks: Very nice but atypical gin martini.Much leaner and complex a very much love it or hate it proposition that is recommended to explore. As to other drinks this one is a new and unexplored territory of taste.Look art some of the ideas that G’Vine and other atypical gins have tried as a point of departure.We hope to have some more idea soon when we can sit down and give this gin some more attention as it deserves. It’s a challenge but a fun one. Bottle: short square clear glass with rounded edges and shoulders with a short neck and a lovely heavy glass decanter base of very compact yet elegant package. 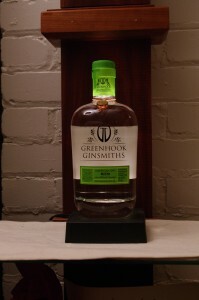 Green Hook Ginsmiths graphics with herbal embellishment is silkscreened to the bottle and a small rectangular bright green paper label is affixed to the front of the bottle leaving plenty of room to contemplate the gin. Other: A passionate gin made by passionate people from some of the best and most organic ingredients on earth. Final Thoughts: Not your parents gin by a long shot ! A very different gin, very herbal and rather dry, reminds me of Old Raj in some ways. Impeccably made in many ways,with flawless execution. Only downside for me personally is the chamomile it is not something I care for (and indeed am wildly allergic too) .